Cancer of the thymus is rare. 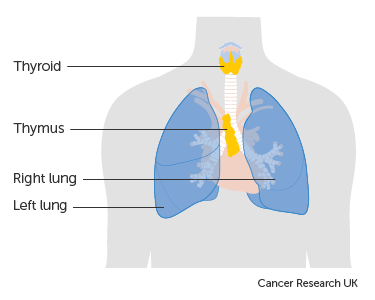 Most cancers in the thymus are called thymomas. There’s also a much rarer form of thymus gland cancer called thymic carcinoma. The thymus gland is in your chest, in between your lungs. A gland is an organ in your body which makes and releases a substance such as hormones. The thymus gland is involved in the development of white blood cells called T lymphocytes. These white blood cells are part of your immune system and fight infection. 90 out of 100 (90%) thymus tumours are in the front of the chest but rarely they might develop in the neck. Thymomas and thymic carcinomas are most common in people between the ages of 50 and 60. But children and elderly people can also get these tumours. Thymomas and thymic carcinomas are cancers of the cells that line of the thymus gland (epithelial cells). Thymoma’s can vary in how they behave. Some grow very slowly. Others grow faster and can spread to the lungs or the covering of the lungs (the pleura). It's very unusual for them to spread anywhere else in your body. Like many other cancers, we don't know exactly what causes thymomas. Some people with thymomas also have a condition affecting their immune system. Thymoma has also been linked to blood conditions such as pernicious anaemia, hypogammaglobulinemia, and red cell aplasia. Thymic carcinomas are much rarer than thymoma’s. They tend to grow more quickly and are more likely to spread to other parts of your body. Because of this they are usually harder to cure. It’s much rarer to also have autoimmune conditions with thymic carcinoma than it is with thymoma. Sometimes thymus gland tumours don’t cause any symptoms. They can be found by accident, when you're having a chest x-ray, CT of the chest or a CT angiogram for something else. You might have one or more of these treatments. Most people with operable thymoma are cured with either surgery alone or surgery followed by radiotherapy. The main treatment for thymus gland cancer is an operation to remove it. Many thymomas are covered in a fibrous sheet called a capsule. These thymomas are often quite easy to remove and are usually cured with surgery alone. The most common surgery for thymus gland tumours is the complete removal of the thymus gland (thymectomy) and the cancer. The surgeon often makes a cut down the middle of the chest, to remove the thymus and cancer. This is called a sternotomy. Sometimes you might have keyhole surgery instead. Keyhole surgery involves your surgeon making small incisions (cuts) rather than large ones, they then carry the surgery out through these excisions. The surgeon removes as much of the cancer as possible. They then use radiotherapy to try and kill off any cancer cells left behind. You might have radiotherapy as your main treatment if you can’t have surgery. Chemotherapy uses anti cancer (cytotoxic) drugs to destroy cancer cells. The chemotherapy drugs you might have include cisplatin, carboplatin, doxorubicin etoposide, paclitaxel, and cyclophosphamide. If you have thymic carcinoma, you might have post operative chemotherapy (chemotherapy after surgery). Your doctor decides whether you need this, based on whether your surgeon can remove all the tumour. Unfortunately, if your thymus gland tumour does come back, it can be difficult to get rid of it altogether. But treatment can often keep it under control for some time. Your doctor will be able to tell you more, by keeping a close eye on how your cancer responds to treatment. You can also talk about this to the Cancer Research UK nurses on freephone 0808 800 4040, from 9am to 5pm, Monday to Friday. Annals of Oncology, 2015. Volume 26, Pages 40-55.